Making a purchase could not be easier. Just browse cbspowertools.com, and click on any items that you wish to buy and add them to the shopping cart by clicking "Add to Cart" and then click "Continue Shopping" if you wish to add more items. After you have finished all your selections, click on "Checkout" and you will be asked for a few details that we need to be able to satisfy the order. All prices include 20% VAT - unless otherwise stated. Note: A full breakdown of VAT charges will be shown on your final invoice. If you choose to create an account your order history and contact details, such as delivery addresses, are stored for your convenience. Using this option means you won’t need to type these details in again next time you shop on our site and you can log in again to check the progress of your order and view your previous orders. If you choose the Continue as a Guest option, no account is created and your contact details and order history will not be retained on the system. We accept payment in British Pounds (GBP) only. Credit or debit card. Click on the Checkout button for this method. PayPal Express. Click on Checkout with PayPal (requires a Paypal account). 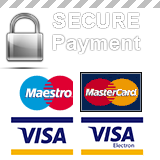 We also accept Credit/Debit card payments over the phone up to a maximum value of £100 . For telephone orders, goods must be delivered to the same address as the cardholders address. AMEX credit cards can be accepted by calling 01733 343031 during office hours. For orders made from the UK or the European Union, 20 % VAT is added. All credit/Debit card numbers are encrypted in the software when the order is placed using 128 bit encryption. They are only decrypted after they reach our offices. They are not held in clear text on any web site. This site is also protected by a Secure Server.